Queen Ena of Spain wears "La Buena"
As we continue on in the lead-up to Halloween, today we've got seven tiaras that nearly succumbed to oblivion. Enjoy seven spooky tales of tiaras that managed to survive -- but only just barely! In 1915, Lady Allan, wife of the Canadian banker Sir Hugh Montagu Allan, packed her diamond and pearl Cartier tiara in her luggage for a sea voyage from New York to Liverpool. Unfortunately, the ship she boarded was the RMS Lusitania, and on the same day it was to dock, it was torpedoed by a German submarine. Lady Allan survived, and so did her two maids -- one of whom was carrying the tiara when she was rescued. 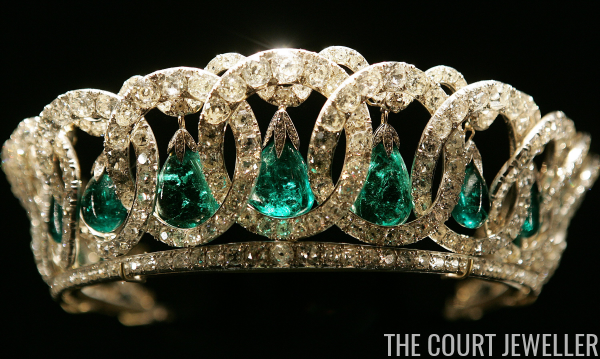 The tiara stayed with the family until last year, when it was sold at Sotheby's for nearly $800,000. 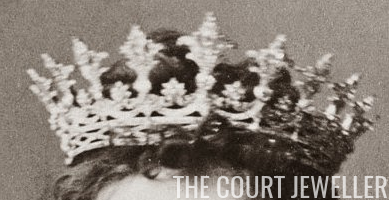 The Allan tiara escaped a watery grave, but this diadem, the Hesse Strawberry Leaf Tiara, managed to survive a fiery fate. The tiara was designed by Prince Albert and given to his daughter, Princess Alice, when she married the Grand Duke of Hesse. It was worn by several of the family's grand duchesses, but in 1937, it nearly escaped a catastrophe. Several members of the family were flying to London for the wedding of Prince Ludwig of Hesse. The plane crashed in Belgium, killing everyone aboard (including Hereditary Grand Duchess Cecilie, a sister of the Duke of Edinburgh). The tiara survived, however, because it was packed in a strongbox. 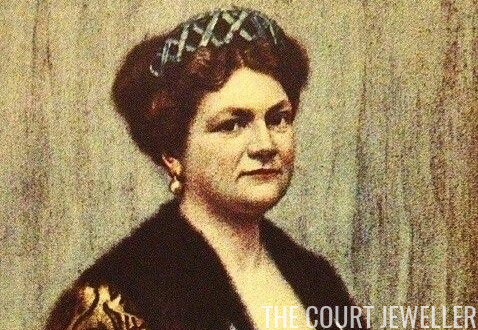 The Hesse family still owns the tiara today. The Strawberry Leaf Tiara wasn't the only diadem on board the ill-fated Hesse plane in 1937. Grand Duchess Eleonore had also brought along her unusual moonstone and turquoise tiara, intending to give it to her new daughter-in-law, Margaret, as a wedding present. Eleonore died in the crash, but the tiara survived, and the remaining members of the family carried out her wishes, presenting the tiara to Peg. Members of her extended family still own and wear it today. The enormous fleur-de-lis tiara in the Spanish royal vaults, known as "La Buena," narrowly escaped tragedy on one of the most important days of its early existence. It was a wedding present from King Alfonso XIII to his bride, Ena of Battenberg, in 1906. She wore it on their wedding day. The ceremony went smoothly, but on the drive back to the palace, an anarchist threw a bomb, concealed in a bouquet of flowers, at the couple's carriage. The royal couple and the tiara all managed to escape unscathed, but numerous Spaniards who had gathered to cheer the procession were killed or injured. Although its beginnings were inauspicious, the Spanish royals still own the tiara, which is earmarked for the use of the nation's queen. 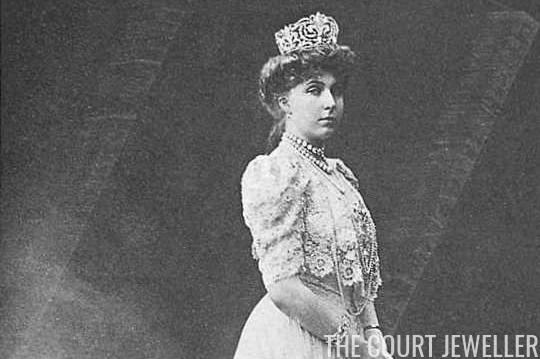 Rather than surviving a horrific tragedy, the unusual cut-steel tiara from the Swedish royal collections nearly disappeared into the hidden depths of the palace's storage cabinets. Although the tiara was made at the beginning of the nineteenth century, it remained unused and forgotten in a palace cabinet until it was rediscovered by Queen Silvia in the 1970s. 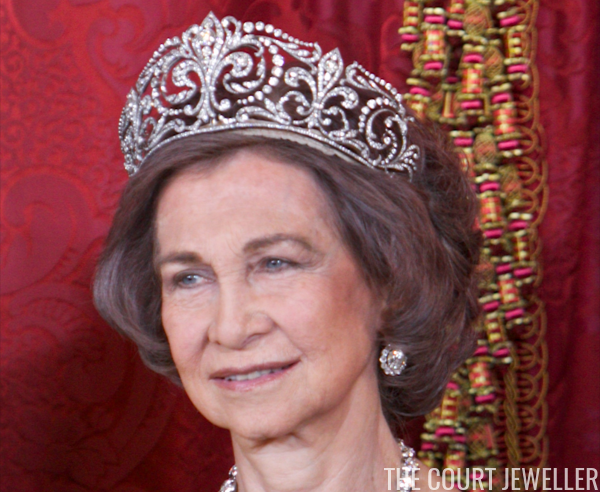 Thanks to her curiosity about the extent of the family's jewelry in the early days of her tenure, the tiara now shines regularly on the Bernadotte women. The classic Victorian-era diamond floral tiara that belongs to the Dowager Duchess of Argyll was almost lost to a very familiar occurrence: an airport baggage mishap. 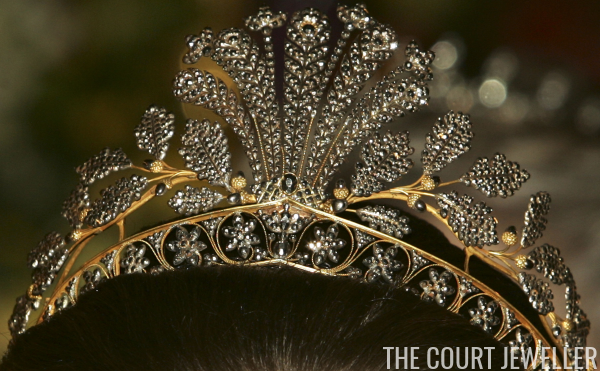 The tiara, along with other pieces of jewelry, went missing at Glasgow's airport. Although the jewels were reported missing, and the police summoned, the pieces seemed to be lost for good -- until the Duchess spotted them in an auction house's catalogue. It turned out that the airport had indeed found the jewels, but they'd sold them to a diamond merchant rather than turning them over to the police. Thanks to its eagle-eyed owner, the tiara was returned to its proper Scottish home. Perhaps the most daring tiara rescue of all, though, was the successful attempt to save the Vladimir Tiara from revolutionary Russia. Although Grand Duchess Maria Pavlovna, wife of the late Grand Duke Vladimir, had managed to make it out of Russia unharmed, she'd had to leave her jewelry behind. Luckily, though, she had a family friend who was also in the British diplomatic service: Bertie Stopford. He made an intrepid journey to Russia and smuggled the tiara out in a plain Gladstone bag. The piece was damaged, but after it was subsequently sold to Queen Mary of the United Kingdom, it was repaired. Today, it sparkles on Queen Elizabeth II at banquets and other white-tie events.